Have you ever listened to an album and asked yourself, “Why didn’t I hear this when it was first released? 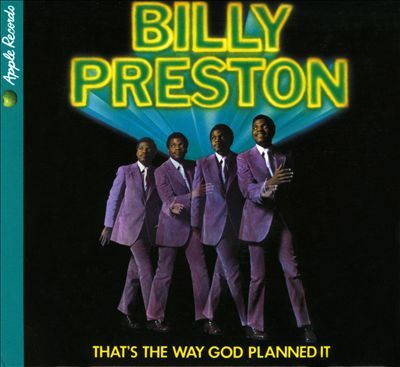 Well, I just finished listening to Billy Preston’s 1969 Apple Records release “That’s The Way God Planned It” and had that reaction. I remember hearing about Preston at the time because it was a big deal that he was credited along with the Beatles on their single of Get Back b/w Don’t Let Me Down. He was an actual “fifth Beatle” and he was black – how cool! I heard something about this album but not enough to interest me in buying it. Why not? Well, it was because Apple records was in the process of imploding along with the Beatles. This is probably the reason I also didn’t yet hear of James Taylor – another Apple artist who would go on to later have a real career. Preston’s album is excellent and, considering his band, on some of the tracks, it should have been Huge in 1969. The tracks recorded at Abbey Road include Ginger Baker on drums (his work on the title track is funky, yet powerful, reminding me of Jack DeJohnette), both George Harrison and Eric Clapton on guitar, and Keith Richards on bass (he is a fine bass player who played bass on the Rolling Stones “Sympathy for the Devil”, for example). The title track is worth the price of admission alone, but, it is not the only treasure here. If I had to pick one track that falls below the high standard set by the others I would pick Hey Brother, only because it is a thinly disguised cover of Hey Joe and no one could do this better after Hendrix. The singing on the studio version of “That’s The way God Planned It” is not as impassioned as the version on Concert For Bangladesh. However, Clapton’s solo and Ginger Baker’s drumming make up for that. Backing vocals by Madeline Bell and Doris Troy are also exquisite. How did I not hear this way back when? I don’t know? Nevertheless, you should listen to this now. And, while you are at it, search out the follow-up “Encouraging Words”. All Music Guide says that it is “about as fine an album as Apple Records ever issued by anyone who wasn’t a member of the Beatles”.